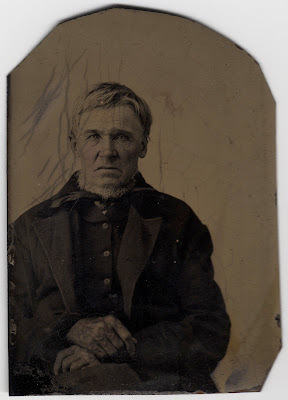 Today, I'm featuring a photo of my Great-great-great-grandfather, Ebenezer Benton. He was born January 6, 1800, in Livonia, New York. His father died when he was only three and when he was a young boy, he was sent to live with his aunt in Litchfield, Connecticut. He married Lovinia Freeman in 1824 and they lived in Franklinville, Hemlock Lake, and later in Andover – all in New York State. In August of 1859, Ebenezer fell from a load of hay and so severely injured his neck and back, he was nearly invalid for the rest of his life. Ebenezer and Lovinia had four boys and six daughters, however the Civil War was particularly hard on them, losing two of their boys to the war. The youngest son died at Deatonsville Road, April 8, 1865, the day before Lee surrendered. The parents later received a pension from the government for the loss of their son. Ebenezer died, September 16, 1880, and is buried in Livonia. What are the odds? A boy from Livonia marries a girl named Lovinia and falls from a wagon becoming invalid. I wonder what he would have had to do to regain his validity? Silly...silly. You are so fortunate that someone saved & passed down these family stories. ... and that someone saved & passed these wonderful photos! It's a very sharp image, you could easily enhance it a bit (with for instance Picasa); I'll email you an example.